A scarce map of the world after Coronelli. Le Globe Terrestre Represente en Deux Plans - Hemispheres, et en Diverses Autres Figures. 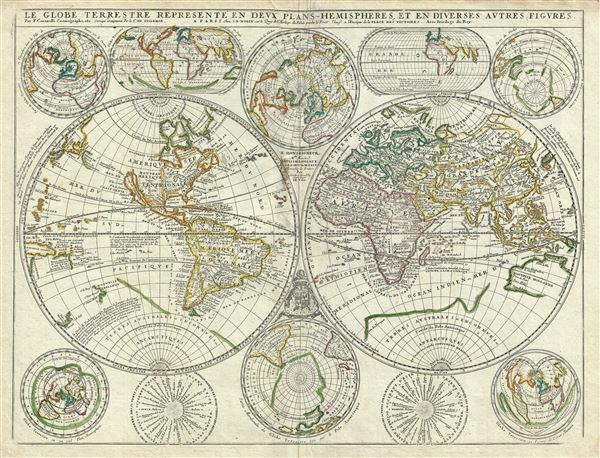 A scarce example of Jean Baptiste Nolin's 1742 map of the world in two hemispheres. The main map is surrounded by ten additional maps showing the world on various projections and at various periods. Cartographically this map combines elements from Vincenzo Coronelli's 1688 globe with updates prepared by Jean-Nicolas de Tillemont. The first edition of this map was published in Paris in 1690 by Nolin. Simultaneously a very similar map was being published in Italy by Coronelli. The Nolin derivative both suffers for its similarity to the Coronelli and benefits from various updates and revisions prepared by Tillemont. Baja California was subsequently discovered in 1533 by Fortun Ximenez, who had been sent to the area by Hernan Cortez. When Cortez himself traveled to Baja, he must have had Montalvo's novel in mind, for he immediately claimed the 'Island of California' for the King. By the late 16th and early 17th century ample evidence had been amassed, through explorations of the region by Francisco de Ulloa, Hernando de Alarcon and others, that California was in fact a peninsula. However, by this time other factors were in play. Francis Drake had sailed north and claimed 'New Albion' near modern day Washington or Vancouver for England. The Spanish thus needed to promote Cortez's claim on the 'Island of California' to preempt English claims on the western coast of North America. The significant influence of the Spanish crown on European cartographers caused a major resurgence of the Insular California theory, of which Coronelli was a primary proponent. Eusebio Kino, a Jesuit missionary, traveled overland from Mexico to California, proved conclusively the peninsularity of California in 1701. It is curious that, despite the 1742 date of this issued and other updates over the 1690 Coronelli model, this issue, has not been rectified. Traveling northwest, away from the mainland, we come across a land labeled 'Terre de Jesso' or 'Terre de la Compagnie.' Yesso or Jesso is a name usually associated with Hokkaido (which here is drawn as part of mainland Asia), this land mass is often mapped either as or together with Gama or Gamaland. Gama was supposedly discovered in the 17th century by a mysterious figure known as Jean de Gama. In actuality both Gama and Compagnie and presented here reflect preliminary sightings of the Japanese Kuril Islands in 1643 by the Dutch navigators Maerten de Vries and Cornelis Jansz Coen. Vries and Coen were searching for Juan de Gama's discovery which was originally considered to be an island replete with silver and other precious metals. On this map we are struck by its uncanny resemblance to Gerhard Muller's peninsula which emerged in the late 18th century. Based on numerous sightings but no significant exploration of the Aleutian Islands, Muller postulated that the archipelago was in fact a single land mass. This he mapped extending from the North American mainland towards Asia much as the 'Terre de Compagnie' does on this map. It is not inconceivable that navigators sailing in the northern seas from Asia could have made this same error in the 16th and 17th centuries - thus explaining Compagnie's curious form. Within the boundaries of the present day United States most territory west of the Mississippi is left unmapped. The Mississippi itself empties into the Gulf of Mexico near modern day Galveston - thus failing to reflect the discoveries of La Salle, a significant omission. Santa Fe is identified on the Colorado River (Rio del Norte) and, slightly further north beyond a range of mountains is Teguayo. Teguayo was identified as one of the Kingdoms of Gold presumed to be found in the unexplored American west. The name Teguayo first appears in the 'Benevides Memorial,' where it is described as a kingdom of great wealth to rival Quivara, another mythical kingdom which curiously does not appear on this map. The idea was later popularized in Europe by the nefarious Spaniard and deposed governor of New Mexico, the Count of Penalosa, who imagining himself a later day Pizzaro, promoted the Teguayo legend to the royalty of Europe. East of the Mississippi French claims predominate and include all five of the Great Lakes, the St. Lawrence, and the shore of the Hudson Bay. Ironically France would soon lose all of these territories in the French and Indian War. In South America Nolin, unlike Coronelli, does not map the mytical Lake Parima or El Dorado, supposedly discovered by Sir Walter Raleigh in the 16th century. He does however identify a large and prominent Laguna de Xarayes as the northern terminus of the Paraguay River. The Xarayes, a corruption of 'Xaraies' meaning 'Masters of the River,' were an indigenous people occupying what are today parts of Brazil's Matte Grosso and the Pantanal. When Spanish and Portuguese explorers first navigated up the Paraguay River, as always in search of El Dorado, they encountered the vast Pantanal flood plain at the height of its annual inundation. Understandably misinterpreting the flood plain as a gigantic inland sea, they named it after the local inhabitants, the Xaraies. The Laguna de los Xarayes almost immediately began to appear on early maps of the region and, at the same time, almost immediately took on a legendary aspect. The Lac or Laguna Xarayes was often considered to be a gateway to the Amazon and the Kingdom of El Dorado. Crossing the Atlantic we find ourselves on the great continent of Africa. Like South America, Africa is well mapped along its shores but speculative in the interior. With regard to the course of the Nile, Nolin has abandoned Ptolemaic two-lakes-at-the-base-of-the-Montes-de-Lune speculation, a legacy of Coronelli who redefined the mapping of this region. Curiously, although Nolin disregards the two lake theory, he has retained the Mountains of the Moon in their traditional position. Just south of the Mountains of the Moon, we encounter the Kingdom of Monomatapa. This region of Africa held a particular fascination for Europeans since the Portuguese first encountered it in the 16th century. At the time, this was a vast empire called Mutapa or Monomotapa that maintained an active trading network with faraway partners in India and Asia. As the Portuguese presence in the region increased in the 17th century, the Europeans began to note that Monomatapa was particularly rich in gold. They were also impressed with the numerous well-crafted stone structures, including the mysterious nearby ruins of Great Zimbabwe. This combination led many Europeans to believe that Ophir or King Solomon's Mines, a sort of African El Dorado, must be hidden in the area. Monomotapa did in fact have rich gold mines in the 16th and 17th centuries, but most have these had been exhausted by the 1700s. Moving into Asia, Sanson offers us a fairly accurate mapping of Asia Minor, Persia and India. The Caspian Sea is corrected to a north-south axis though remains a bit lumpy in form. He names numerous Silk Route cities throughout Central Asia including Samarkand, Tashkirgit, Bukhara, and Kashgar. Nolin identifies the apocryphal Lake of Chiamay (Chaimai) roughly in what is today Assam, India. Early cartographers postulated that such a lake must exist to source the four important Southeast Asian river systems: the Irrawaddy, the Dharla, the Chao Phraya, and the Brahmaputra. This lake began to appear in maps of Asia as early as the 16th century and persisted well into the mid-18th century. Its origins are unknown but may originate in a lost 16th century geography prepared by the Portuguese scholar Jao de Barros. It was also heavily discussed in the journals of Sven Hedin, who believed it to be associated with Indian legend that a sacred lake linked several of the holy subcontinent river systems. There are even records that the King of Siam led an invasionary force to take control of the lake in the 16th century. Nonetheless, the theory of Lake Chimmay was ultimately disproved and it disappeared from maps entirely by the 1760s. Next we turn our attention to the Austral Seas. Australia itself appears as New Holland. Much of the northern and western shores, including the Gulf of Carpentaria, have been mapped but the eastern shores remain unexplored and the interior entirely unknown. Tasmania, labeled 'Pays de Diemens' appears according Able Tazman in 1642 mapping. A little further south and east we encounter an extremely embryonic New Zealand. There is no trace of the two island layout or, for that matter, an eastern shoreline. Also in evidence is the mysterious 'Terre de Quir' a great landmass supposedly discovered by the 16th century Spanish navigator and religious zealot Pedro Fernandez de Quiros. Quiros set sail in search of the speculative southern continent and may in fact have discovered several important South Seas islands; however, he stopped just shy of glory and turned around shortly before sighting New Zealand. Even so, Quiros was a voracious self-promoter and descriptions of his findings were circulated throughout Europe. Terre de Quir or Terre de Quiros appears on various maps of the region until put to rest by the 18th century explorations of Captain Cook. Further north, Nolin also maps the Solomon Islands, doubtless a Tillemont update as these were omitted from Coronelli's earlier work. Massing at the base of the map is the speculative southern continent or 'Terre Australes et Inconnues ou Antarctiques'. Long before the discovery of Antarctica, the southern continent, supposedly capping the South Pole, was speculated upon by European geographers in the 16th and 17th centuries. It was thought that the globe was a place of balances and thus geographers presumed the bulk of Eurasia must be counterbalanced by a similar landmass in the Southern Hemisphere, just as, they argued, the Americas counterbalanced Africa and Europe. Many explorers in the 16th and 17th centuries sought the Great Southern continent, including Quiros, Drake, and Cook, but Antarctica itself was not truly discovered until Edward Bransfield and William Smith sighted the Antarctic Peninsula in 1820. It is noteworthy that here we find fictious cartographic convention conflictiong with actual discoveries. The shoreline of Terre Australes extends north, suggesting a connection with New Zealand before vanishing into the Pacific. Similalry, the mapping of western Australia, conflicts with traditional mappings of Terre Australes. Tiera de Fuego, presented here in insular format, lacks a southern border, again suggestion connection with the mysterious fictive landmass. Le Continent Occidental ou L'Amerique est aussy nomme le Nouveau Monde et Les Indies Occidentales, quelques uns des Anciens sont connu sous le nom de Isle Atlantique, ou Atlantis Insula. The Western Continent or America is also named the New World and the West Indies, in the times of the Ancients it was known as the Atlantic Islands or Atlantis. The map is surrounded by ten additional map including projections illustrating the world before and after Columbus, illustrations of both polar regions, wind roses, and world maps on various alternative projections. Regarding the dedication. The first edition of this map was issued in 1690 and bore no dedication. The map was re-engraved sometime in the mid-1690s with a dedication to Louis de Boucherat, Chancellor of France. Later, after 1699, the dedication was updated to Louis Phelypeaux, who had just become the Comte de Pontchartrain in 1699. This dedication remained until the final edition in 1742, the present example. Jean-Baptiste Nolin (1657 - 1725) was a French cartographer and publisher active in Paris during the late 17th and early 18th centuries. Nolin was a man of exceptional business acumen and while many cartographers struggled financially, he prospered. Many attribute this to the fact that Nolin produced very little original work, relying primarily on business relationships with the legendary Italian cartography Vincenzo Coronelli, Jean-Dominique Cassini, and the French geographer Jean Nicolas du Trallage, Sieur de Tillemont (1620–1698). His work is known for exceptional aesthetic élan, combining Italianesque baroque and rococo ethics with most current cartographic data. It might also be said that Nolin was a bit of a con-artist in his self-promotion, often inaccurately using such titles as 'Engraver to the King' and 'Geographer to the Duke of Orleans', neither of which appointments he actually held. In 1705, he was successfully sued by Guillaume De L’Isle for copyright infringement, a case which cost him significant scientific credibility. Nonetheless, Nolin remained commercially popular and prosperous. Nolin's son, also Jean Baptiste Nolin (1686 - 1762) inherited his father’s map plates and republished many of his maps, as well as issuing his own unique maps, well into the 18th century. Both Nolins maintained offices on Rue St. Jacques, Paris. Jean-Nicolas de Tillemont (fl. c. 1640 - 1720), a.k.a. Jean Nicolas du Tralage, Sieur de Tillemont, was a French cartographer best known for his collaborations with the Italian cartographer Vincenzo Coronelli and French map publisher Jena Baptiste Nolin. Most of Tillemont's work involved re-engineering and updating Coronelli's maps for the French market in partnership with Nolin. Little else is known of his life. Very good. Some centerfold wear, especially in upper quadrants. Minor discoloration near the dedication. Shirley, Rodney W., The Mapping of the World: Early Printed World Maps 1472-1700, 546.